The FATJAM is a day I always look forward to. We can win prizes and ride the jumps with all the other riders. There was also a barbeque with Frikandellen and Hamburgers. I had a plan. I wanted to jump the Killer Jump which is much bigger than me. Daniel Wedemeijer helped me jump it. That made me happy. 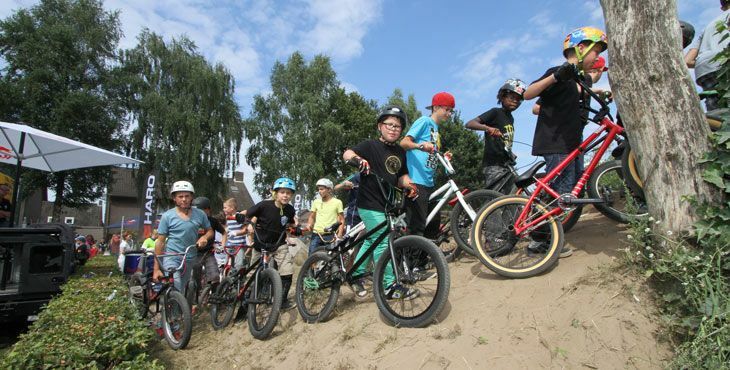 It was a fun day to ride with all the BMX-ers at the Sugar Hills Trails in Aarle-Rixtel. Yesterday after dinner my dad and I drove to the Helm Trails for a dirt session. The Helm Trails are on the other side of the city. Dimitris Araouzos, Bart Mol and Dennis Keunen were also going to come. Dad told me that Raymon van der Biezen was also going to be there. He was at the Olympics twice as a BMX racer so I was looking forward to meet him in my hometown. Lots of locals were there already. The place was pretty full. The table line was once again changed since the Dutch Championships from a few months ago. The first one was steep, so Riccardo changed it a little. It was better after that. We rode for two hours. I met Raymon van der Biezen. I wanted to do an interview but then I had to go home. Maybe next time.